Analysis of vessel interactions reveals large potential for illegal activities, researchers say. (Inside Science) -- Out in the middle of the Atlantic, the scene unfolds like this: A fishing boat rendezvouses with a huge refrigerated cargo ship. In a matter of hours, the fishing boat offloads thousands of pounds of pollack to the refrigerated vessel and then heads back out to sea. Transferring fish or other cargo from one boat to another, an activity called transshipping, is not necessarily illegal. But because it happens beyond the watchful eye of port authorities and lacks consistent regulation, the potential for illegal fishing, drug smuggling and human rights abuses runs high. Now for the first time, researchers have exposed transshipping activity on a scale never before seen. By analyzing the largest dataset ever of vessel interactions, the scientists have revealed transshipment behaviors and estimated the corresponding global extent of it. Between 2012 and 2017, the researchers counted nearly 60,000 instances of nautical behavior that may indicate transshipping, laying bare the immense potential for illegal fishing and human trafficking, said the study's lead author Nathan Miller, a data scientist at SkyTruth, a nonprofit organization that uses remote sensing technology to monitor threats to Earth's natural resources. In an article published today in Frontiers in Marine Science, the authors describe the worldwide distribution of these 60,000 instances, which also represent an initial step in connecting disparate nodes of a widespread network of vessels, ports, and owners that operate in an industry largely obscured from public view. "This type of data is not available broadly and yet it's critical if we're going to understand issues related to how much fish is being removed from the ocean, issues related to illegal, unregulated and unreported fishing, issues related to human rights abuses and labor abuses -- all of which have been linked to transshipments," said Miller. Over the five-year study period, Miller and his team, which included scientists from Google and Global Fishing Watch, a SkyTruth project to map the location of vessels involved in the fishing industry, zeroed in on the transshipment activity using a few different methods. They parsed a dataset of 32 billion automatic identification system messages, which are automatically-generated, anti-collision radio signals sent every two to 180 seconds from vessels more than 120 feet long. Embedded in each signal is a nine-digit number called a Marine Mobile Service Identity, the first 3 digits of which indicates the country of the flag flying on the ship's mast. They cross-referenced the information with other known details, including a transshipment vessel's International Maritime Organization number and a database of fishing vessels. From this, the researchers were able to map activity that could indicate transshipment. They found 10,233 occasions when two vessels—a fishing boat and a transshipper—lingered within 500 meters of each other for at least two hours, traveling less than two knots, while at least 6.2 miles from a location where ships commonly anchor. The team also mapped 46,570 events where a large transshipment vessel loitered seemingly by itself. On these occasions, automatic identification system messages were coming from just one vessel, not a pair. This could indicate transshipment to a smaller vessel, since automatic identification system transmitters are not mandatory on all fishing vessels and use varies globally among different fleets. The researchers counted the event as a transshipment if the lone vessel was traveling at speeds of less than two knots for at least eight hours, while 20 nautical miles or more from shore. Nearly 50 percent of the suspected transshipment events that the team identified occurred on the high seas beyond national jurisdictions. Of the more than 6,000 fishing boats that fished for more than 24 hours on the open ocean, 1,181 had at least one encounter with a transshipment vessel. The researchers discovered that transshipment activities appear most commonly around the equatorial regions of the Pacific, Atlantic and the southern Indian Oceans, as well as on the fringes of fishing zones designated exclusively to one country, called exclusive economic zones, of Peru, Argentina, Japan and Russia. Africa also sees its fair share, with transshipments clustering on the edge of the East African exclusive economic zones. "This study shows us the magnitude of global transshipments," said Reniel Cabral, a postdoctoral researcher in the Sustainable Fisheries Group at the University of California, Santa Barbara, who was not involved in the research. "Whether it's illegal or not, we can't say," he said. 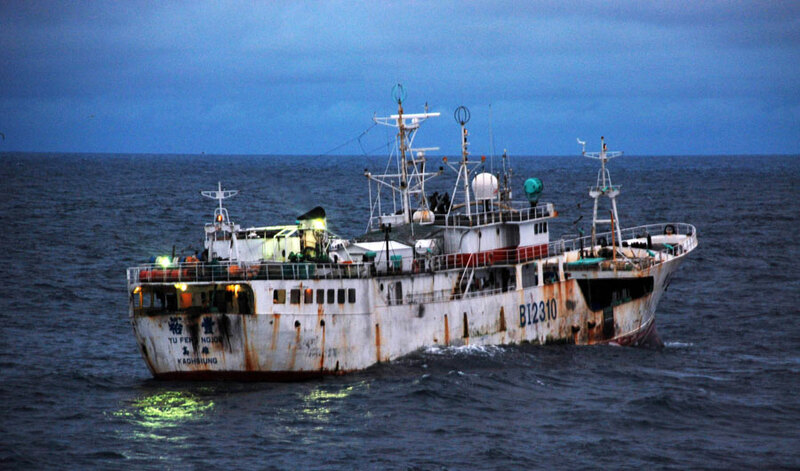 But the information could aid countries trying to crack down on illegal fishing, he added. If they see that a transshipment is happening in their waters or near their exclusive economic zones, but it has not been reported, they can ping the ship or collaborate with countries to check the vessel. Miller and his team hope that this work and future studies like it lead to greater transparency. They're currently working on identifying the owners of shipping fleets, which Miller said are often hidden behind shell companies. Rosemary Rayfuse, a professor of International Law at the University of New South Wales said that stopping illegal fishing is a huge concern. "We have made great strides since the 1990s in dealing with unregulated fishing, but we haven't fixed it." Tracy Staedter, a freelance science writer based in Boston, writes for Earther, IEEE Spectrum, Seeker, Live Science, HowStuffWorks, DAME and more.